Hospitality Lawyer: What lies ahead for the hotel industry? When do values bottom? When do they recover? Which markets are worst and which will be the best? How to unlock hotel value with JMBM’s SAVE® program . . .
Hospitality Lawyer in New York at the NYU hotel investment conference with some interesting projections from Steve Rushmore of HVS. One of my favorite presentations at the NYU hotel investment conference earlier this month was by Steve Rushmore, president and founder of HVS. His entire slides show is worth studying and you can view it in its entirety by clicking on the link at the end of this article. 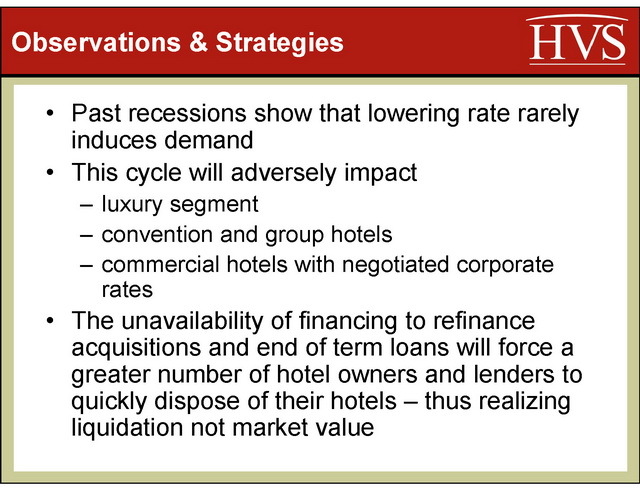 But a few of the slides particularly caught my attention — the ones on hotel values — when they bottom, when they recover, best and worst markets for the next few years, and along with some good advice for buyers, lenders and owners. When do values bottom and how long to recover? We have all seen the statistics from Smith Travel Research and PKF Consulting. The numbers are nasty — we are looking at an 18% RevPAR decline for 2009 year to date in the U.S. lodging industry, and even higher declines in certain geographic markets like New York, Las Vegas, and Hawaii, and in certain segments like luxury, resorts and hotels relying on group business. These RevPAR declines translate into even higher multiples of decline in revenue (roughly 1.5 to 2.0 times), meaning that operating revenues may no longer cover debt service coverage or even operating expenses like payroll and utilities. But when do we hit bottom? 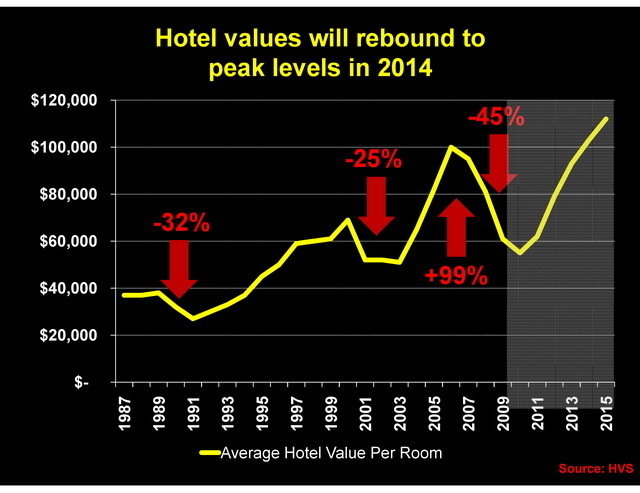 And how long does it take to get back to hotel values we had in 2007 or 2008 before “the Crash”? 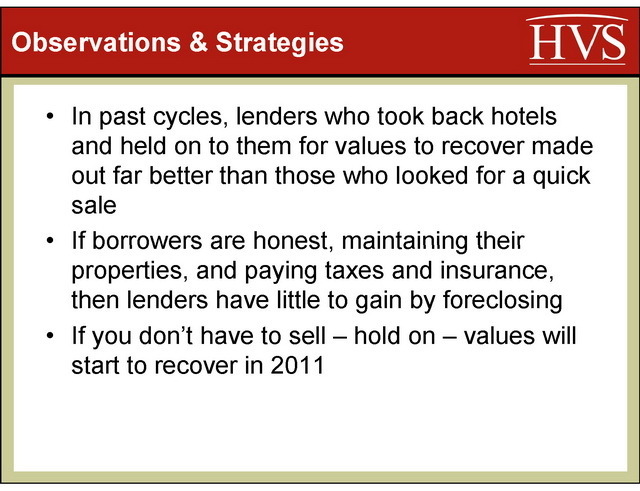 This slide (#11 in the HVS presentation) shows that Steve thinks we bottom out on hotel values sometime in 2010 or 2011, and he predicts a full recovery to pre-Crash values by 2014. You may have noted that some experts think it could be a long slow recovery, with pre-Crash values not being recovered until the end of the next cycle after this one (with a typical real estate or hotel industry cycle of 7 or 8 years, that could be about 15 years)! So this is good news that Steve sees it this way. Which markets will suffer most and recover first? 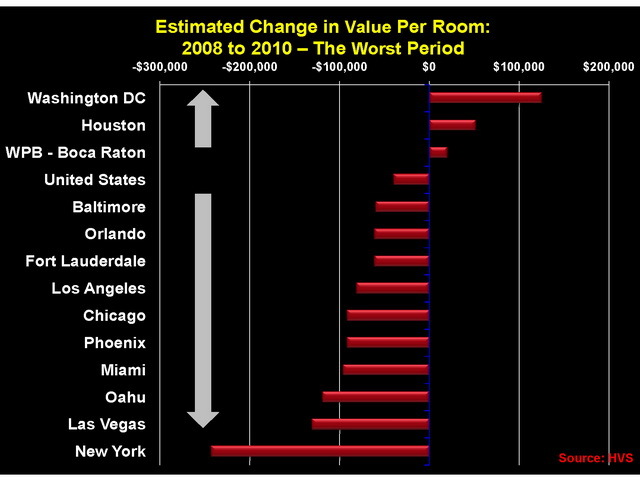 Steve also gave us his thoughts on where the pain will be greatest in the 2008-2010 period, which he calls the “worst period.” As you can see from the slide below, he predicts that New York, Las Vegas, Oahu, Miami and Phoenix will be the worst markets during this period. 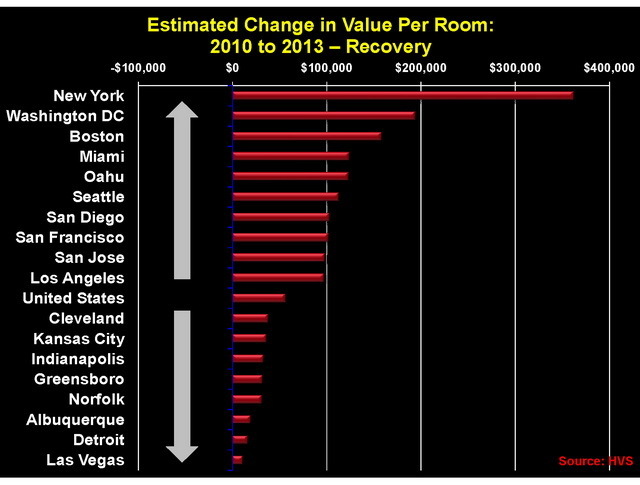 And while New York, Miami and Oahu will be amongst the fastest markets to recover in 2010-2013, they will not be joined by Las Vegas and Phoenix. Washington, DC is a unique market that is doing well now, and will also do even better when the industry improves. What does this all mean for buyers, lenders, and investors? The next two slides show Steve’s recommendations, which largely correspond with our SAVE® program’s focus on unlocking value through a combined legal and operational approach. To sum it up: This is time for serious strategic analysis, the SAVE® program, and getting ready for opportunities of our lifetime. For more information on how to unlock hotel value with troubled hotel loans or assets, see JMBM SAVE® program. For the entire slide show presented by Steve Rushmore at NYU, please click here.